Meridith McNeal participated in The Four Seasons show in Spring/Summer 2017 at Village West. Meridith McNeal is a Brooklyn-based artist, educator, curator, arts administrator and hula hooper. Meridith has been a Visiting Artist at the American Academy in Rome in the spring of 2008, in the spring of 2009, in summer 2010, spring of 2013, summer 2014 and in the spring 2017. Her work is represented by Figureworks Gallery in Brooklyn, New York. 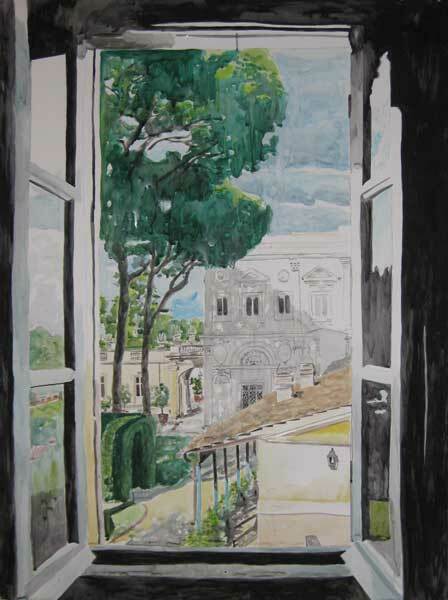 Meridith's recent solo exhibitions include Finestre e altei oggetti magici, Il Tramonto, Sperlonga, Itlay; Hot Town, Summer in Italy, Gorilla Arté, Sperlonga Italy; Liar, Liar at Figureworks Gallery, Brooklyn, NY; Camera con vista: incantevole windowphilia; Hyunnart Studio Gallery, Rome, Italy; 50/50: Brooklyn/Sperlonga at ex chiesa sanctae mariae de Spelonchae, Sperlonga, Italy; "Rome and a Villa" at Corridor Gallery, Brooklyn, NY; In the Footsteps of the Starry Messenger at Figureworks Gallery in Brooklyn, NY; La dispensa at Santi, Roma, Italia; Magical Things at St. Joseph's College Alumni Gallery, Brooklyn, NY. Her work was included in the Outdoor Banner Project, FiveMyles, Brooklyn, NY; Cautionary Tales: Old Visions Through New Eyes, President's Gallery, John Jay College, NYC; Sodom by the Sea Salon, Coney Island Museum, Coney Island USA, Brooklyn, NY; Day After Day, Museum at SUNY Albany, Albany, NY; The Influential Female - Drawings Inspired by Women in History, Kentler International Drawing Space, Brooklyn, NY; Mapping: Memory and Motion in Contemporary Art, Katonah Museum of Art, Katonah, NY. She is included in You Are Here/NYC: Mapping the Soul of the City, Katharine Harmon, Princeton Architectural Press, 2016; Map As Art, The: Contemporary Artists Explore Cartography, Katharine Harmon, published by Princeton Architectural Press, 2009. Meridith's book Magical Things was published in 2009 and In The Footsteps of the Starry Messenger in 2011, both by Blurb. In 2017 Meridith will present three solo exhibitions Inside/Outside Windowphilia, Figureworks, Brooklyn, NY, The View from Here at FiveMyles Gallery in Brooklyn, NY and In Reflection, Torre Truglia, Sperlonga, Italy. In the spring 2017 Meridith will represent Sperlonga Italy in the renown Fabriano Paper Festival. Her current and upcoming curatorial efforts include Notes from Abroad, 107 Bowers Gallery & Art Space, Jersey City, NJ, summer 2017); Voyager, St. Joseph's College Gallery, Brooklyn, NY, spring 2017 and Well Traveled, Corridor Gallery, Brooklyn, NY, fall 2016. Meridith has curated over 90 exhibitions and is on the artist advisory boards of Kentler International Drawing Space and the Coney Island Museum; she also serves on the Curatorial Committee of the Brooklyn Public Library. She is the Director of Education for Rush Arts a not-for-profit organization dedicated to providing underserved youth with contemporary art education, and developing and supporting artists, curators and new audiences. More information on McNeal and her work can be found at google.com/meridithmcneal.